Breast cancer has affected several people in my own life recently and is one important issue that all women, and everyone who loves them, need to be aware of. The body of research is always growing and changing to best serve those in the front lines finding cure and the rest of us looking for ways to reduce our risk. 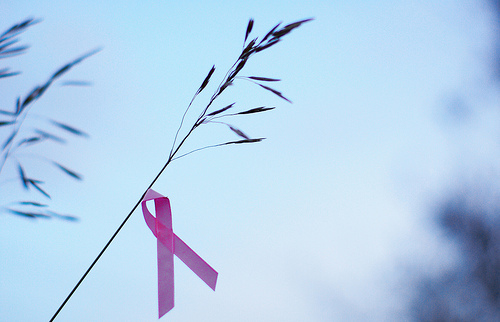 Breast cancer is the second most common cancer among American women. About 1 in 8 (12%) women will develop invasive breast cancer sometime in their lifetime. About 230,480 new cases of invasive breast cancer will be diagnosed in women. About 57,650 new cases of carcinoma in situ (CIS) will be diagnosed (CIS is non-invasive and is the earliest form of breast cancer). There are risk factors and genetics that you cannot control, but there are also many choices you can make to reduce your risk of breast cancer. These are the top ten that show strong enough evidence for me to be comfortable recommending them. Breastfeeding. The evidence is increasingly strong that breastfeeding, especially if continued for 1.5 to 2 years, offers cancer protection to both mothers and their children throughout their lifetimes. Celebrate World Breastfeeding Week and breastfeed for health! Physical Activity. Women with the highest physical activity levels show 14-20% lower breast cancer risk. Studies suggest varying amounts of exercise necessary, but even walking 1.25 to 2.5 hours per week can reduce risk by 18%. Healthy Weight. Weight gain in the adult years is of particular concern in reducing the risk of postmenopausal breast cancer. Amazingly, weight gain of 22 to 44 pounds increases risk up to 50%. Weight gains beyond 44 pounds show a 45-87% percent increase in risk. Lower Percentage of Body Fat. Body fat is also of particular concern for postmenopausal breast cancer. Higher percentages of body fat increases the body’s levels of estrogen after menopause and higher insulin levels. Greater levels of both estrogen and insulin increase risk of estrogen-sensitive and estrogen-negative breast cancer respectively. Plant-Based Diet. Choosing a healthy, whole-food, plant-based diet can reduce breast cancer risk. How significantly is undetermined, but it is recognized that a healthier diet will lead to healthier weight and lower body fat. Eating at least 5 servings of vegetables and fruits (organic whenever possible), whole grains, and high fiber foods, while avoiding processed meat and red meat. Green smoothies anyone? Reduce Sugar. Regular consumption of sugar, particularly processed sugar and refined carbohydrates, increases the risk of breast cancer. Studies show that this is still true even for women with a healthy body mass index. Of course, a high intake of sugar will also contribute to weight gain and increased body fat. Limit or Eliminate Alcohol. As much as most women likely don’t want to hear this, alcohol consumption is one of the clearest links to increased risk of breast cancer. Risk increases by 5-10% with each daily drink and those who consume more increase their risk significantly for every additional drink. Stop Smoking. Women who smoke or inhale passive tobacco smoke have as much as a 60% increased risk of breast cancer. Toxic Chemical Exposure. There are more than 200 toxic chemicals that have been explicitly linked to an increased risk of breast cancer due to hormone disruption. Exposure begins prenatally and continues throughout our lifetime. The current science is clear and the body of evidence is growing, but knowing which chemicals to avoid can go a long way toward reducing cancer risk. Atrazine – a common pesticide. Can be found in food and drinking water due to agricultural run-off. Check this list of all product and brand names. Bisphenol-A (BPA) – used to make polycarbonate plastic and epoxy resins. Plastic wrap, polycarbonate plastics (often marked with #7 recycling code), canned foods, baby formula containers, soda cans, and even thermal paper receipts. Polyvinyl Chloride (PVC) – a very common plastic used in flooring, shower curtains, toys, and packaging. Problematic byproducts of PVC are dioxins, vinyl chloride, phthalates, and lead. Phthalates – used to bind fragrance to many personal care products, paint, and anything with a fragrance and allow it to be absorbed more easily into the skin, as well as PVC and #3 plastic. Phthalates can be listed as fragrance or phthalate, as well as DEP, DEHP, dibutyl, or diethylhexyl. Polybrominated diphenyl ethers (PBDEs) – a particular class of flame retardant chemicals used in furniture foam, electronics, and some plastics. The EPA is phasing these out in the U.S.
Perfluorooctanoic acid (PFOA) – used in non-stick, stain-resistant, and grease- resistant coatings on cookware, clothing, carpets, furniture, food papers and other products. Teflon®, Stainmaster®, Scotchguard® are some of the brand names. Styrene – found in Styrofoam food containers, egg cartons, disposable cups and bowls, opaque plastic cutlery, and #6 plastics. Practice Self-Care. Taking care of oneself is important to be healthy no matter what. simply taking care of mind and body can go a long way toward overall health. But, most importantly early detection saves lives. Know your body and use breast self-exams, but do not rely on these alone. Ask your health care provider to perform a Clinical Breast Exam (CBE) at least every 3 years and once a year if you are over 40. Get mammograms as you and your doctor deem necessary. Learn about any family history so that you can be even more vigilant about prevention and early detection. Note: I do my best to find the best scientific evidence and reliable information, but medical decisions should always be seriously considered and discussed with your doctor. Great post and such an important tips for every woman….. This is such an important and helpful post, Brenna! I’m going to share it with others. I’m so sorry to hear that breast cancer is touching your life. We have so much cancer in our family, and it’s one of my biggest motivations for living as healthy a lifestyle as possible. I appreciate you sharing, Charise! I think it has been easy to overlook the link between healthy living and reduced risk of cancer (among other serious illnesses). I hope that we all can take a look at our lifestyles and see some changes that will hopefully start to reduce cancer rates across the board! I really appreciate this post. Your explanations of simple ways to reduce risk are really helpful! Thanks, Aly! If they are helpful to even one person, that would be wonderful. Thanks for sharing the risk factors in plain english! stumbled. Glad that it was easily understood. If women can recognize the individual choices they have, perhaps we can work on real systemic change. Thanks for the stumble! Great points. I’d say these reasons make up a great checklist vital to reduce the risk of any disease. Oh, most definitely, Alison. Most of what is listed will affect the risk of many other types of cancer or other disease too. And really, what we should all learn is just how connected many of these choices in lifestyle are. Great list Brenna! The things on your list will just make you healthier also! Raw honey is the best! Thanks for sharing with Healthy 2day Wednesdays! Hope you’ll participate this week! This blog is very informative i really love these kind of blogs where the things is in detailed..!! !